I’m Uncle George and am a retiree from the University of Texas at Austin. I’m 69 years old and have been a resident of Austin for 43 years. I have been producing these pocket holsters for the last ten years now. 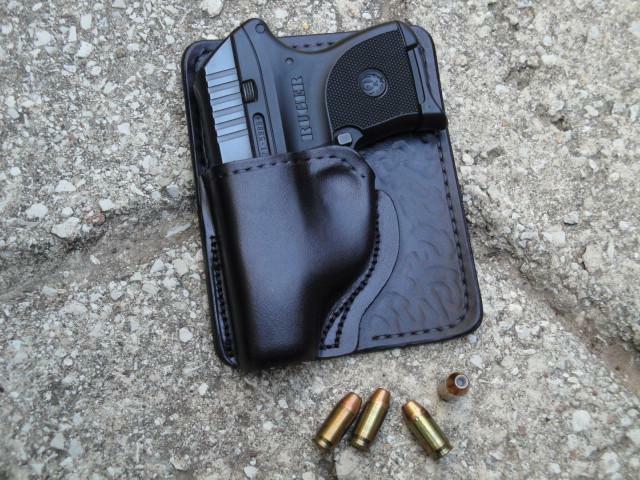 My holsters are genuine all-leather wallet holsters made from the best Hermann Oak Leather and are specifically made for concealed carry. They are only available in black leather. My holsters are designed to be carried in the pants/jeans hip pocket. Some folks have found that it also works for them in their front pockets. I only make holsters molded for specific small pistols that I consider to function well with the holster as it was intended. I do not make holsters for any other guns or take orders for any other custom holsters or leather work. I only accept payment through Paypal shopping carts available on this website. The price is $45.00 (plus $4.50 non-refundable shipping and handling). Texas residents 8.25% sales tax will be added. I only make holsters for the pistols below. Click on the pistol for more information and access Paypal shopping cart.